On October 25, 2017, the $4.5 million Pendleton Flats apartment community officially opened with a grand opening celebration attended by numerous members of the development team as well as local dignitaries including; City Manager Troy Schulte, Kansas City councilmen Quinton Lucas, Jermaine Reed and Scott Wagner, as well as Housing Authority Kansas City leaders Donovan Mouton and Ed Lowndes. 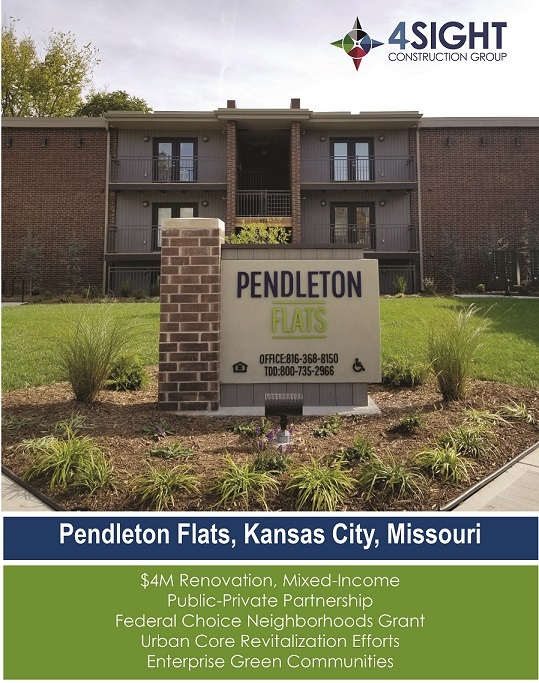 Pendleton Flats is the first project associated with a $30M U.S. Department of Housing and Urban Development (HUD) federal housing grant received by the City of Kansas City in 2015. Pendleton Flats offers modern, amenity-rich affordable living in the Paseo Gateway neighborhood in the historic Northeast. The Paseo Gateway neighborhood covers almost one-square mile and includes approximately 4,800 residents. 4Sight Construction Group served as general contractor, and project team members include, superintendents Shawn Coy, Al Bradford, and Rafael Yepez, and laborers Chris Hodge, Ryan Hodge and Jake Perry. Ian Leftwich served as project manager. Client Brinshore Development, LLC noticed and appreciated 4Sight’s hard work, attention to details and close attention to timelines. The next Brinshore project to break ground includes the Pendleton ArtsBlock project in which 4Sight Construction Group will serve as general contractor and DRAW architecture + urban design is the architect. Pendleton ArtsBlock is also a mixed-income product that includes a mix of market-rate and affordable-rate units, and a number of stART up tenant spaces that house artist-run entrepreneurial businesses.